Can This Off-Center Hammock Really Be As Comfy As a Bed? 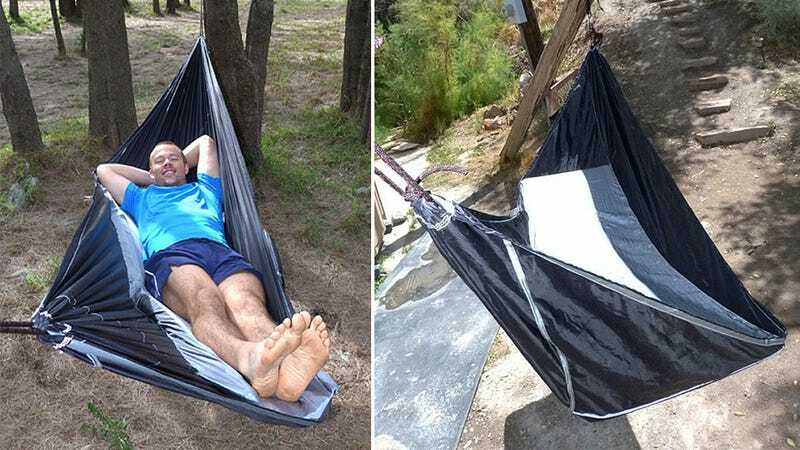 No one's ever called the hammock industry out on false advertising, but the image of someone comfortable napping in a net suspended between two trees is a lie. Finding your way in and out of a sagging hammock is an ordeal equal to mounting Everest, and once you're in, you're swallowed up by netting that's slowly leaving its imprint on your bare skin. So if the bizarrely shaped Sky Bed sleeping hammock delivers on its promises, it could revolutionize how we all spend Labor Day. The Sky Bed's most notable feature is its innovative asymmetric design that actually ends up providing a surprisingly flat place to stretch out when used with a foam or inflatable sleeping mat. So while it feels like you're camping on the floor of a tent, you're still kept off the cold ground overnight.